During the November 2010 election, Petitioner Andrew Cilek entered his designated polling place in Hennepin County. He was wearing a “Please I.D. Me” button and a Tea Party t-shirt with the message “Don’t Tread on Me” and a Gadsden Flag. Cilek twice tried to enter the polling place, and on each attempt he was told that he either needed to cover his t-shirt and button, or take them off in order to vote. He refused. On his third try, Cilek was allowed to vote, but the election judge wrote down his name and address for potential prosecution. Pursuant to Minnesota election law, Section 211B.11, all political apparel is banned inside a polling place, including political badges, political buttons, or other political insignia. Campaign-related material promoting specific candidates is prohibited, as well as material “designed to influence and impact voting (including specifically the ‘Please I.D. Me’ buttons)” and “[m]aterial promoting a group with recognizable political views (such as the Tea Party, MoveOn.Org, and so on).” Election judges at each polling place determine whether an individual is in violation of the statute. Those in violation are asked to remove the materials or to cover them up. Those who refuse to comply are still allowed to vote, but their names are recorded for potential prosecution. 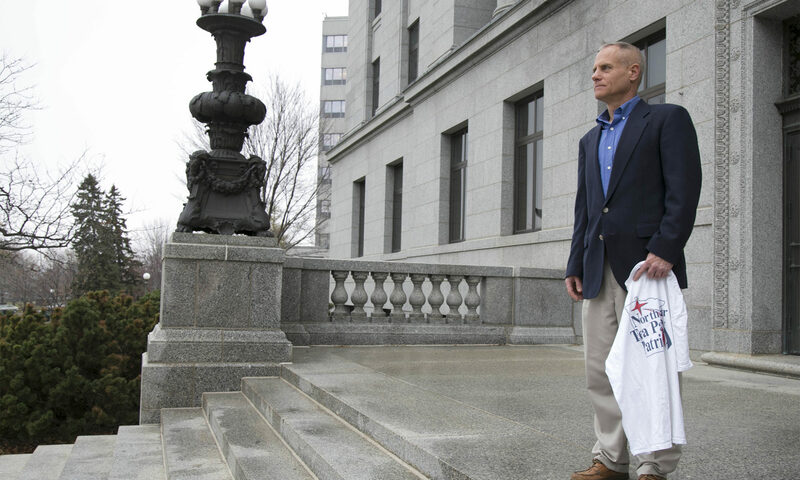 Cilek, along with his organization, the Minnesota Voters Alliance (together, Petitioners), filed a lawsuit claiming Section 211B.11 violated the First Amendment, both facially and as-applied. The District Court dismissed Petitioners claims, and on appeal, the Eighth Circuit upheld the ban against Petitioners’ facial claim and reversed the district court’s dismissal of the as-applied claim, remanding it back to the district court. Petitioners filed their first petition for a writ of certiorari, which was denied by the Supreme Court, and the case proceeded in the lower courts, where the as-applied challenge was rejected again. Petitioners then filed another writ of certiorari, limited to the facial challenge. The Supreme Court granted writ and heard oral arguments on February 28, 2018. In Burson v. Tennessee, the Supreme Court upheld a section of the Tennessee Code which prohibited solicitation of votes and the display or distribution of campaign materials within 100 feet of entrance to polling places. The Court found the code section to be narrowly tailored to serve the compelling state interest of protecting the right of its citizens to vote freely and effectively. Justice Anthony Kennedy posited the question of whether political speech should be allowed in polling places at all, since voters are there to vote and nothing else. Justice Ruth Bader Ginsburg and Justice Sonia Sotomayor built on this question, asking if a state could constitutionally limit any kind of political speech in a polling place, since it is not a public forum. Justice Alito pointed out that in the current political climate, many things have a political implication; therefore, on election day, Alito mentioned how each voter would have to have knowledge of every candidate and every ballot question, thereafter determining if what they were wearing has a political connotation. Counsel replied by pointing out that a reasonable person would only recognize those political messages that were “well known.” In response to this, Justice Alito questioned Counsel as to whether rainbow flags on t-shirts would be permitted, or whether an NRA t-shirt would be permitted, as both could be linked to political issues. Counsel responded that a rainbow flag would be allowed as long as there was not a question related to gay rights on the ballot. However, an NRA t-shirt would not be allowed, as it has a “clear indication” that it relates to a political issue. Although Burson suggests otherwise, it is likely that the Justices will rule in favor of Petitioners, finding the statute not to be narrowly tailored. As Justice Alito’s line of questioning suggests, in this political climate, many slogans and insignias can have a political connotation. Nevertheless, Respondent’s argument and reliance on Burson, that political material in the polling place could intimidate voters, is a valid state interest. A decision is expected by June of this year, so we will have to wait a few months to find out if that interest is compelling, as well as whether Minnesota has narrowly tailored its voting laws to address that interest. Amy Howe, Argument preview: Justices to hear challenges to Minnesota voting dress code, SCOTUSblog (Feb. 23, 2018). Amy Howe, Argument analysis: Justices debate decorum, line-drawing and “political apparel at the polls, SCOTUSblog (Feb. 28, 2018). Amy Howe, Justices to hear challenge to Minnesota voting dress code: In Plain English, SCOTUSBlog (Jan. 22, 2018). Burson v. Tennessee, 504 U.S. 191 (1992). Petition for Writ of Certiorari, Minn. Voters Alliance v. Mansky (2017) (No. 16-1435). Transcript of Oral Argument, Minn. Voters Alliance v. Mansky (2018) (No. 16-1435). Photo courtesy of Pacific Legal Foundation.